The beginning of the holiday season is right around the corner. It is often the busiest and most profitable period of the year for ecommerce merchants. Now is the time to plan your holiday pay-per-click advertising campaigns. There are many pay-per-click initiatives that merchants can take to drive additional qualified traffic to their sites for the holiday season. Here is a list of five tasks that can be conducted right away. Product Listing Ads offer very detailed product segmentation. 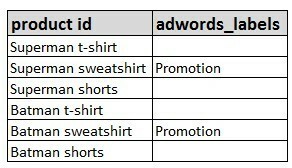 In particular, focus on the “AdWords_Labels” product feed attribute. This allows you to tag specific products in your feed with custom labels. For example, say you know which products show you the highest margins. You can classify these products in your feed with the label “High Margin.” Within your AdWords PLA campaign, you can then create an ad group targeting these higher margin products, with a higher bid than other ad groups. Create a custom AdWords label to identify holiday promotion products. Dynamic remarketing gives you the ability to show extremely relevant ads to all visitors who come to your site. Keep in mind, however, that ads generally take one to three days for Google to review. Make sure all of your holiday ads are implemented in advance. AdWords for video is a good way to drive qualified traffic to your website and your YouTube channel. You can place ads in front of related YouTube videos. Your ads link directly to your videos on YouTube. Visitors can then decide to view more of your videos or click directly to your website. These ad formats are as follows. In-stream. Ads that play for at least five seconds before or during a video. You pay only when viewers watch your entire ad, or the first 30-seconds of it. In-slate. Ads that show before a YouTube partner video that is ten minutes or longer. You pay when viewers choose to watch your ad. In-search. Ads that show above or to the right of listings — very similar to keyword searches on Google. You pay when a viewer clicks on your ad. In-display. Ads appearing at the top right of an individual video page. You pay when a viewer clicks on your ad. A sample "in-search" ad from Lowe’s on YouTube. Along with standard metrics such as clicks, impressions, and conversions, AdWords also provides metrics on video views, duration of views, and follow-on subscribers to your YouTube channel. These remarketing ads — which appear across Google’s Display Network — can reengage those visitors who haven’t been to your site, but have interacted with your YouTube channel. Continuing the remarketing theme, Facebook has a retargeting platform called Facebook Exchange. Visitors who come to your site are eligible to see your ads on Facebook. Companies such as AdRoll and Perfect Audience allow you to place a tracking cookie on every page of your site. Like AdWords remarketing, lists are set up based on views of specific pages. Facebook ads can be displayed in the top right of the screen and within the news feed. Within your ads, you can highlight holiday promotions while using an eye-catching image. Here’s an example of an ad from AT&T. Facebook remarketing is easy to set up and provides an opportunity to stay in front of your visitors. Bing Ads continue to gain market share. According to a study conducted by Rimm-Kaufman Group, Bing Ads saw a 58 percent spending growth year-over-year in the second quarter 2013. The platform has significantly evolved over the last year with more tools and features now available to advertisers. Bing Ads also make it easy to import campaigns directly from AdWords, both through the web interface and the desktop editor tool. As you create campaigns and ads for your holiday promotions in AdWords, remember to also implement in Bing.